Their book The Barefoot Spirit: How Hardship, Hustle, and Heart Built America’s #1 Wine Brand, released this week, is such an entertaining read that you won’t notice you’re digesting practical advice for anyone with a dream of business success. Yahoo! Small Business spoke with Houlihan and Harvey by phone from their Sonoma County home about how the “Barefoot spirit” and their experiences translate to other businesses. Yahoo! Small Business: What is "the Barefoot spirit?" Houlihan: Our book is really about the fundamental guiding principles we subscribed to that enabled us to overcome insurmountable challenges—not just with our business but in the wine industry with its myriad complex regulations, with supermarkets and distributors, and so on. 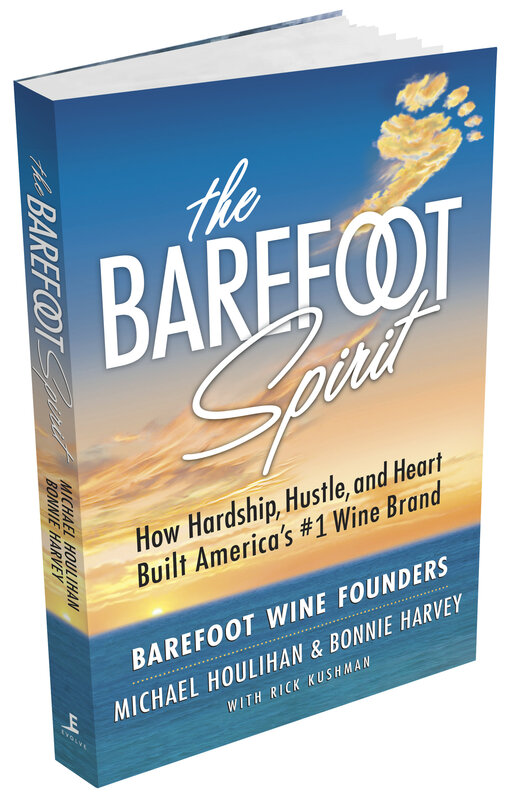 The Barefoot Spirit isn’t about the wine business; it’s about any business. The challenges entrepreneurs face are the same challenges we faced. The spirit is what’s behind the brand—the DNA and the life force of the business. It’s what was behind all our decisions, and why we supported all of these nonprofits instead of advertising. It’s about why people gave us extra credit when we were late on payments. All of that has to do with the Barefoot spirit. Your grandmother called it the Golden Rule. Your mother told you to treat others the way you want to be treated. We asked, “how would you like to buy your own product,” or “how would you like to loan money to yourself?” If you think about each one of these situations that happen in business, and you have empathy for the other person and realize what their goals and concerns are, you can allay those fears by treating them like a true partner. YSB: What was your goal for Barefoot Wine? Harvey: Because it started out as a trade for a debt for a grower, our initial goal was to create a brand and sell it on the marketplace to pay the grower back. We thought we would put a few bucks in our pocket and enjoy a few years of building this business, sell the brand, and go on to another business—see what it was we really wanted to do. Houlihan: But you know how goals are. When we realized it was a get-rich-slow scheme, we started to say, “if this is what we’re going to do, it has to mean more to us than a mercantile business.” That’s when we realized we could support nonprofits and worthy causes as means of advertising. We began to get really excited. Today we’re mostly excited that it has had a big impact on making the world a better place—from clean beaches to civil rights. You have to stand for something more than the business you’re in. So many people get involved in business and forget that it’s an opportunity for them to express their true interests. YSB: How did the Barefoot spirit contribute to your company’s culture? Houlihan: Companies use terms like “we’re on a strictly need-to-know basis.” We had a “know the need basis.” We asked everybody on our staff for input. We could tell them, “We could get discontinued in a major supermarket, and it could mean all of our bonuses disappear. Anyone have any ideas?” Everyone from the receptionist, to the accounting department, to people in the warehouse would come up with great ideas. It boils down to how you include your staff in your business. We only had two divisions: sales and sales support. If you weren’t in sales you were in support, no matter what you did. If you were a winemaker you were in sales support. Their bonuses were based on sales. They would ask, “How would my job affect sales?” I would say, “You’ll figure it out.” And they did. YSB: And how was the Barefoot spirit conveyed in the product? Harvey: Just having a fun wine label was revolutionary. Wine was such a snobby thing; you had to have an enology degree and speak French to drink it. I was intimidated. I came to find out there were a lot of other people who felt the same way. Barefoot made it easy. When we first started we had a sauvignon blanc and a cabernet sauvignon—both difficult to pronounce. We made it easy by calling them Barefoot Blanc and Barefoot Cab. YSB: The book focuses so much on the marketing that the product seems almost secondary. Houlihan: When we got started, we asked the marketplace what they needed and found out that most wine was sold in supermarkets and that most supermarket shoppers were women. They were buying “Tuesday night wine,” as opposed to Saturday night wine, at velocity pricepoints—the price at which most wine sells. Today that’s $6.99 - $9.99 a bottle. In those days it was less. We realized that our customer was a 37-year-old mother who wanted a brand she could rely on. She bought wine with staples like flour and bread at the supermarket. We developed the first nationally successful non-vintage wine. Our wine had no date on the label, so we weren’t stuck with whatever came out of the harvest that year. And our appellation was not one region, but all of California. So we didn’t just chose a wine that was low cost, we got the best at the best cost and blended it to distinct specifications—the amount of sugar, acid, and a library of blends. We always tried to match the future blend to the past blend for a consistent taste, which was more important to our end user. But we had to get through the gatekeeper: the predominantly male buyer. They said, “This will never sell.” It became the number one wine brand in the U.S. because we were giving the 37-year-old mom with 2.5 kids exactly what she wanted. YSB: The Barefoot spirit also played out in your advertising efforts, right? Harvey: We did lots of tastings and fundraisers and donated wine to nonprofits that were important to our customer. In the process, we had great interfaces with the customer and were able to get a lot of feedback about how we were doing. YSB: And you did all this in the days before social media. What do you think would have been different if you had Facebook and Twitter back then? Harvey: Our results would have been considerably different. We had face time instead of Facebook and high touch instead of high tech. Because we had an interest in what our customers did, we had real “social” media. I don’t think it would have been the same at all if we’d had these current media options. The thought leaders even in social media today say you’ve really got to get out there and meet people. Face time is more effective than “likes” on your Facebook page. We preach that. It’s important for anybody in any industry to really get to know the customer. YSB: How else could your experiences benefit business owners in other industries? Houlihan: Most people starting in business have two fears: I don’t have enough money and I don’t know what I’m doing. These are advantages. When you don’t know what you’re doing, you’re going to ask questions that are way outside the box. You might hit on something like we did—that a wider appellation offers a consistent flavor profile that changes the industry. Or that blends work and they don’t have to be dated vintage varietals because there is a big market out there that wants a consistent flavor year to year. That’s an example of looking at your customers and ignoring the industry. And when you’re broke you can’t just throw money at every problem. Rather than advertise our wine, we’d go into neighborhoods that were adjacent to markets we wanted to be in. We would find out what was important to those neighborhoods. Was it kids education, clean air, clean water, a new library? We donated our wines and our support to those groups. We took their messages and put them on our bottlenecks and had the audacity to say, “don’t just spend $5 on our wine, give $10 to the Surfrider Foundation.” That’s an example of our “worthy cause marketing.” If you don’t have money to compete with the big boys, then outsmart them; do something they never thought of. YSB: Now you work as consultants to other entrepreneurs. How are you helping them? Houlihan: Our consulting is about giving your business the American spirit and know-how and not just throwing money at everything. We had a client who was brokering wine doing only $500,000 a year in business. He was in debt and facing a couple of lawsuits. We helped him to the point that he is making $10 million a year. He has taken over the space he is, redesigned his business model to be more sustainable, and is creating jobs. What we bring to the table is that it’s really nice to have an advisor on your board of directors who has already made the mistakes that you are about to make and can stop you from doing that. We’re not just working with wine industry businesses. We’re working with a tech company … a group trying to create access to public land … and with returning veterans interested in entrepreneurship. YSB: Do you miss running a wine business? Harvey: One thing we enjoy now, which we didn’t have the opportunity to enjoy as much then, is the wine industry events. We were very often behind the table. Being on the other side of the table allows us to appreciate what it was that our consumers and the public enjoyed. We get to go listen to the music and taste wine.